HDIB? Neuroscience Grand Rounds II: Thoracic Outlet Syndrome | How Do I Baseball? 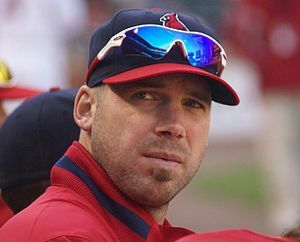 For the 2013 St Louis Cardinals, there will be a mainstay of the pitching staff conspicuously missing from spring training, with news that starter Chris Carpenter will miss most, if not all, of the season, due to continued issues stemming from thoracic outlet syndrome. Symptoms such as numbness, tingling, and discoloration of his pitching hand arose during a brief pitching session, and prompted shutting him down to prevent further injury; less than a year removed from surgery, Carpenter’s return and recovery look to be a little more complicated and lengthier than what was originally hoped. So what is this condition that limited Carpenter to 30.2 innings of regular and postseason baseball in 2012, and why does it threaten his 2013? Top of the line stuff, no doubt. Broadly, the thoracic outlet is simply the area between the ribcage and collarbone, also known as the clavicle. As you can tell from the picture, this area is chock a block full of important things; muscles, arteries, veins, and important neural elements that comprise the brachial plexus, which is a complex of nerves that originate from the spinal cord. The nerves responsible for arm, forearm, and hand movement all arise from the brachial plexus; as you can tell, this is a very busy and crucial piece of anatomical and physiological real estate. It is also a very small, crowded piece of real estate, which substantiates many of the problems encountered by those who suffer with TOS. Let’s talk about those symptoms, and some possible causes shall we? Yes, we shall. Much like our good friend Brandon McCarthy and his hematoma, folks who suffer from TOS do so at the hands of very particular process, seen across many different medical disciplines and disorders. Smooshing. TOS is a transient smooshing disorder. McCarthy’s smooshing was a bit more dangerous, since it arose from his brain swelling and smooshing into his cranium, a part of the anatomy without much give, shall we say. TOS is nonetheless a dangerous situation, as the pressure and swelling that arises from the initial injury or insult can cause smooshing, displacement, and compression of a number of critical structures in the already cramped thoracic outlet (the superior thoracic outlet, more specifically). OK, so we have lots of anatomy, small space, smooshing- let’s dig a little deeper. There is an initial insult – that’s fancy talk for a cause – that sparks the swelling and compression. Let’s talk about those for a second, kind and gentle readers impromptu medical residents. You, with the Hello Kitty stethoscope, can you name some causes of TOS? Nice list – yes, common causes of TOS include trauma arising from a car accident, a specific type of lung tumor called a Pancoast tumor, and any work that creates a repetitive motion and strain on the area, say, like pitching, swimming, or any other sort of over the head motions. Know it all medical residents who raise their hand over and over to answer questions are at risk of suffering from TOS. Not sayin’, just sayin’. Also, people born with an extra cervical rib can have a predilection towards TOS, as the additional skeletal anatomy provides less of an outlet and square footage for the nerves and vasculature to course through. We have cause… how about effect? Symptomatically, TOS arises from what structure the smooshing affects, and can broken down into 3 categories: neurogenic, arterial, and venous. Regardless of the structures involved, pain is the most prominent symptom. From there, we can also see symptoms such as the ones Carpenter complained of, such as numbness and tingling, arising from nerve compression, skin that is discolored and cold to the touch, arising from poor circulation due to compressed arteries and veins, and muscle weakness. OK, so let’s take these symptoms, and confirm that it truly is TOS – how would we do that? Aside from your usual suspects, in the form of imaging – x-rays, CT scan, or even a MRI – we can perform a costoclavicular maneuver, or be on the look out for Adson’s sign before we subject the patient to any undue insurance copays. However, these two methods aren’t very specific or sensitive, so some sort of x-ray, scan or even an electromyography (EMG) exam should be performed to confirm a diagnosis of TOS. So our hypothetical diagnostic studies are back, and it’s TOS. Young residents, what do we do to treat it? You, wearing glasses with no lenses with them, whatcha gonna do? Start with physical therapy, then consider a surgical procedure called a first rib resection/scalenectomy, where a surgeon goes in, removes a rib, the scalene muscles, and any scar tissue that could be the compressive culprit, thereby, opening up the superior thoracic outlet, creating more space, and less smooshing opportunities? In the immortal words of FP Santangelo – abso-LUTELY! Let it also be known that cortisone and botox injections are other treatments that are less invasive, but may not completely resolve the underlying issue, but can give the patient a modicum of relief, enough to allow them to pursue physical therapy. While time will tell whether Carpenter can overcome the nagging effects arising from his thoracic outlet syndrome, the prognosis looks fairly encouraging, as the vast majority of those who elect to get surgery enjoy symptom free lives post-operatively. However, there does exist a small population around 5% – who remain symptomatic after surgery, and require further interventions, be it additional surgery, or other non surgical options. For those so inclined, you can read more about TOS here and here; it’s a small sample of what’s out there, but hey, Google is your friend. As for our Cardinal friends, 2013 still looks to be a promising year, even without their pitching and emotional leader toeing the rubber. While it remains to be seen if this is the last of Carpenter’s career, let it be known that this Redbird’s wing is well on the mend.